with 2-song colored vinyl 7"
The Reverend Peyton is the best guitar player I have ever seen. We wrote these songs over the past couple years, whenever I've been able to stop in Indianapolis for a few days. The Reverend plays delta blues so straight that it sounds like punk rock. And I play whatever the hell I play. Together, we've written a pile of songs that sound like they were born somewhere between New Orleans and Transylvania. Take a listen to the tracks below. I hope you will enjoy. As a small public service, the record comes with a small dictionary, telling how to say "Two Bottles of Wine" in one-hundred-eleven languages. This is the third record in a series of collaborative projects by myself and songwriter friends from around the world. Only 1,111 numbered copies of this disc will ever be made, so order quickly! 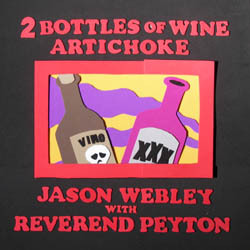 All songs (C)2007 by Jason Webley and Reverend Peyton.